Don't forget: Last chance to register your team! Late registration will close at the end of this month. To be a part of iGEM 2018 you must register and pay before April 30, 2018 at 11:59PM EDT. Distribution Kits are on their way! TAKE a picture! Use the official hashtags #iGEM2018 and #WelcomeToiGEM on social media to let us know you got your kit. We will collect the most creative photos and show them off! DO NOT FREEZE! Some components of the Distribution Kit cannot be frozen - make sure to carefully read the storage instructions in the kit before proceeding. Still choosing what to work on? Human Practices at iGEM is about understanding which problems synthetic biology can help solve, and exploring the impacts of your project on the world. Is your project responsible and good for the world? Winning teams consider these questions upfront and throughout their entire project. This integrated approach is part of designing a successful project and essential to being an engineer. Learn more and get started with human practices today. 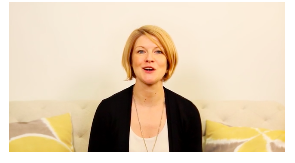 Visit the Human Practices hub, watch the introductory video, and check out resources, exemplary projects, and tips for how to succeed in the competition. Are you interested in adding $4000+ dollars of value to your team budget? What about saving countless hours of pipetting time to use on other aspects your 2018 project? Apply to receive 1 of 10 free robots as part of an exclusive partnership between iGEM and Opentrons. By automating some of the most common protocols iGEM teams encounter, you can free your time for other things like planning and expanding your project. 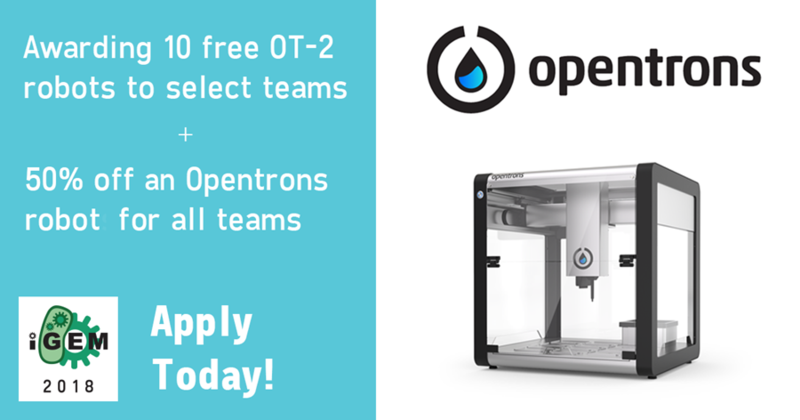 All iGEM teams will also be eligible for a 50% discount on their first Opentrons robot. Learn more and apply by clicking the button below. *DEADLINE SOON* Apply by May 1! Fun fact: Opentrons is an iGEM startup! The earliest OpenTrons robots were developed by the Genspace team in 2014. Now they're excited to give back to the iGEM community. iGEM HQ and the Measurement Committee would like to announce the new Measurement Hub (http://2018.igem.org/Measurement) adding to the wiki hubs available on this year's iGEM wiki. This is the place where you can find information about good measurement practices and information about participation in the InterLab Study, which is an option for one of the Bronze Medal criteria. If you have questions about measurement in your project or the InterLab study, please contact the Measurement Committee at measurement@igem.org. We hope you find this new hub useful and helpful! Save the date! The iGEM 2018 Giant Jamboree will be held on October 25 - 28 in Boston, MA. The evening Awards Ceremony will end late on Sunday, October 28, followed by our celebratory social events. New for this year, there will be special activities Monday, October 29. iGEM will co-sponsor tours with local companies, as well as other Boston area university tours. We can't wait to see what you'll do!